The flu season is definitely in full swing all over the country. 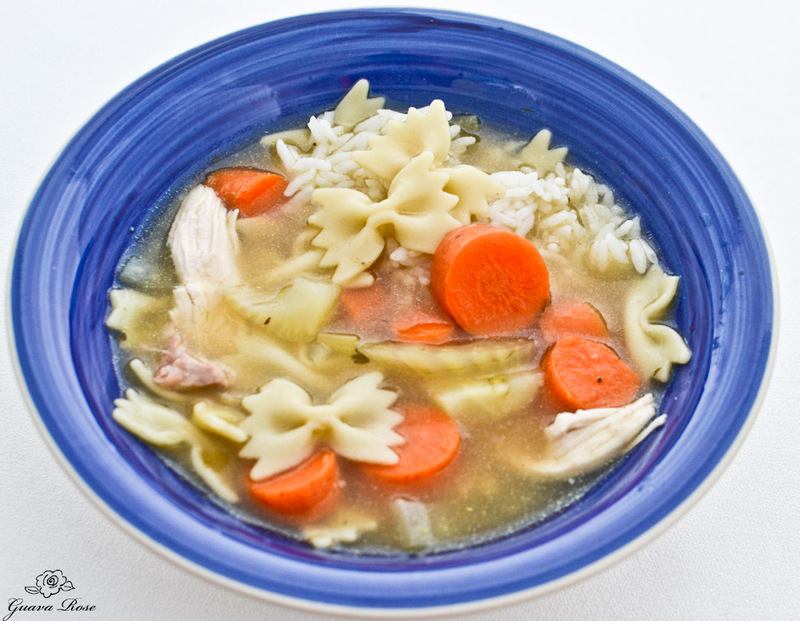 It knocked me out for the past few weeks, and chicken noodle soup seemed to be mostly what I wanted to eat. When you’re not feeling so well though, and you want to make a nourishing bone broth, a rotisserie chicken comes in handy. Try to get an organic or free range one if you can. Separate out all the bones and skin to use for the broth, and save the meat for later. 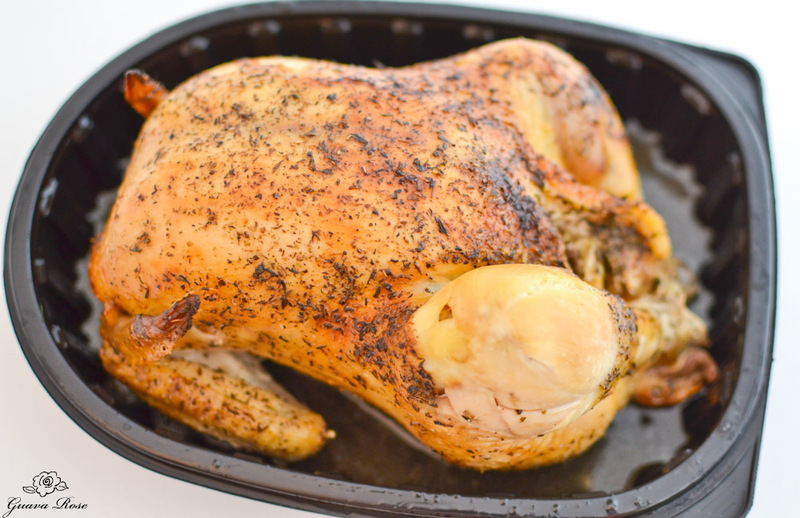 One benefit of using a rotisserie chicken vs. a raw chicken is that the broth will taste much better since the bones have already been seasoned a bit and roasted. 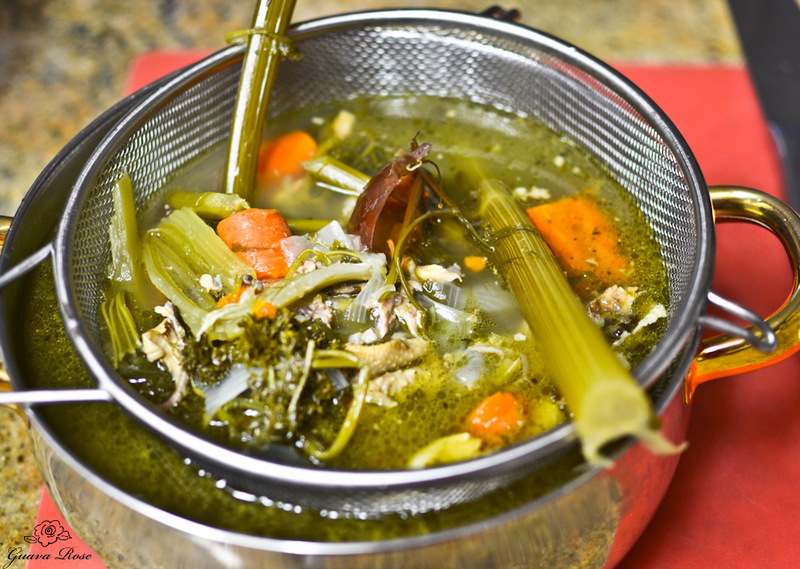 In addition, you will have meat to add back into the soup after the broth is done, as well as to make easy chicken salad sandwiches or chicken dishes. The sandwiches were definitely handy to pack for school lunches. 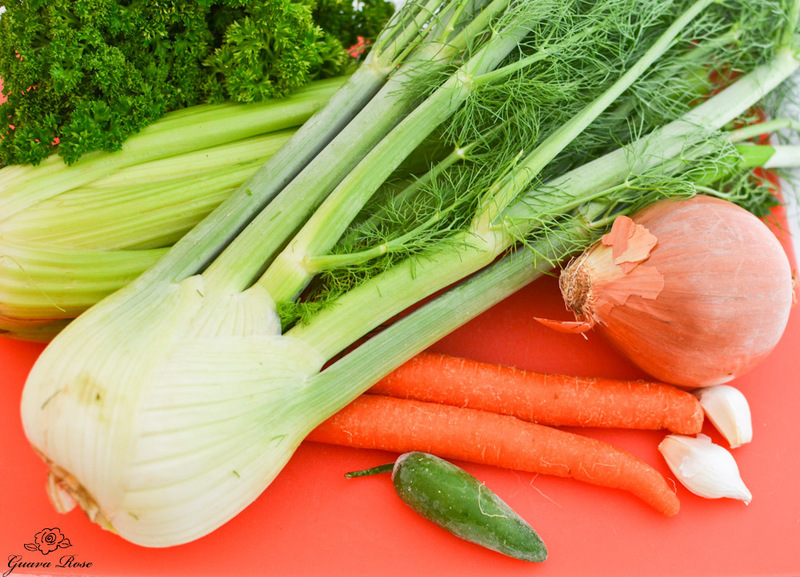 Vegetables for the broth: parsley, celery and/or fennel stalks, carrots, onion and garlic (no need to peel these), and a small jalapeno pepper. I keep a bag of fresh jalapeno peppers in the freezer, specifically to have on had for making broth. Several black peppercorns would also do. Add water until everything is just covered. Stir in 1/4 c. vinegar, which will help to release the minerals from the bones into the broth. Strain the broth. Skim off any fat. Season to taste with sea salt. In addition, sometimes I add some good quality vegetable or chicken bouillon cubes. 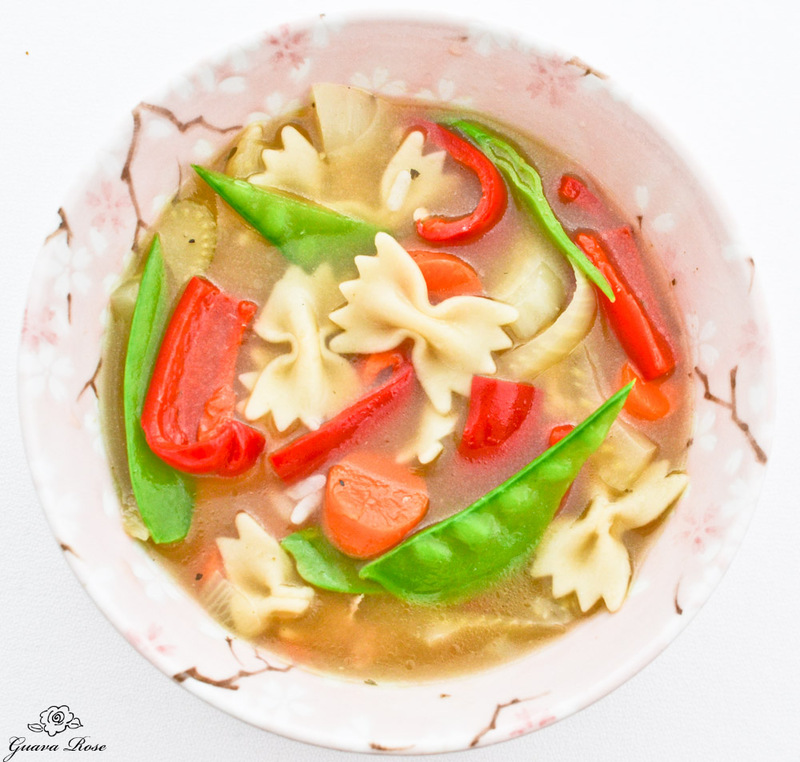 A little powdered vegetarian chicken bouillon from the natural food store is a favorite with my kids. 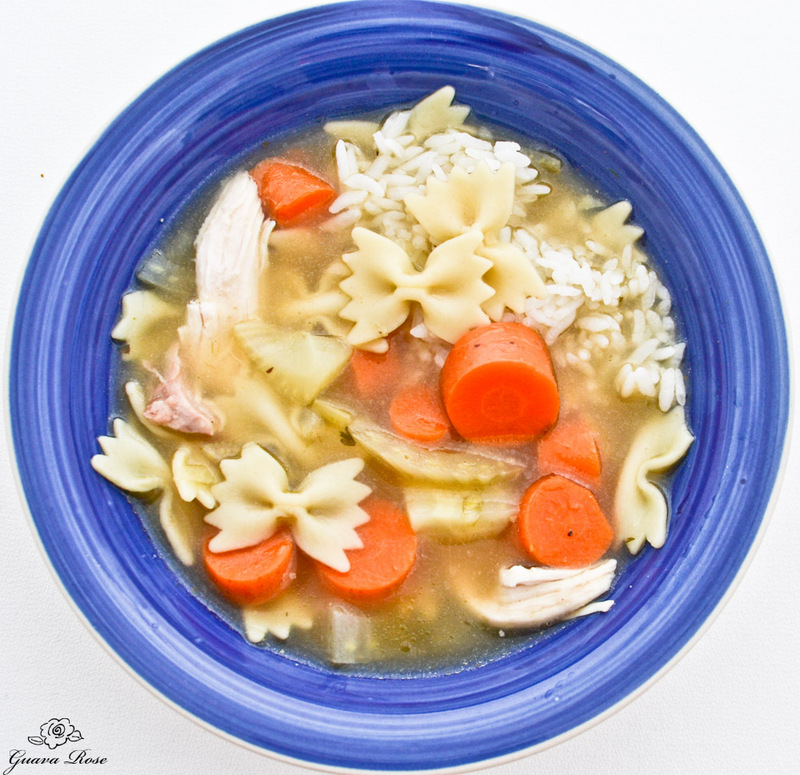 Of course I had to add a little rice for the island classic of chicken noodle soup + rice. Bring the seasoned broth to a low boil, then add some extra vegetables if you like. I just kept it simple and added some carrots and sliced fennel bulb. I don’t think most people really feel like eating a whole lot of vegetables when they’re sick– at least my family doesn’t. Turn the heat down to low and let the vegetables simmer until they are almost tender. 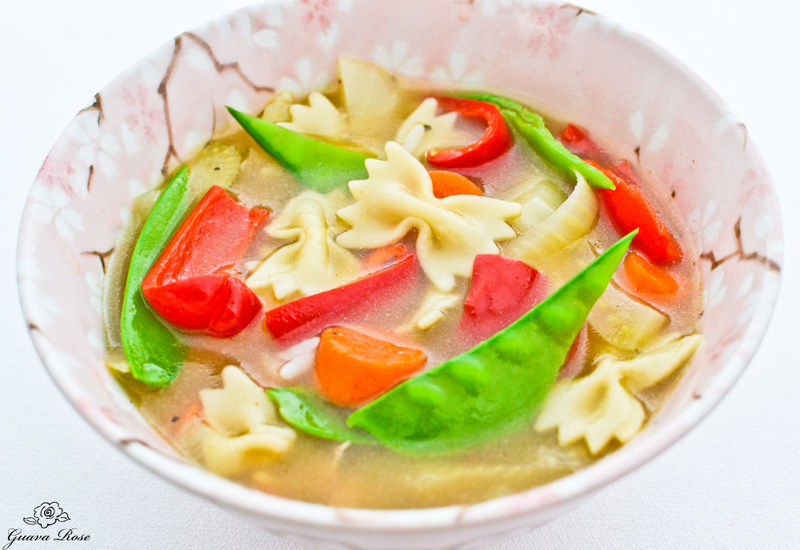 Then you can add about a cup of any small pasta (mini bow ties pictured) and let the soup simmer until the pasta is done. Add some chicken meat and allow it to heat through before serving. I hope you are all healthy and well! Remove skin and bones from chicken. Cover and refrigerate meat for later. 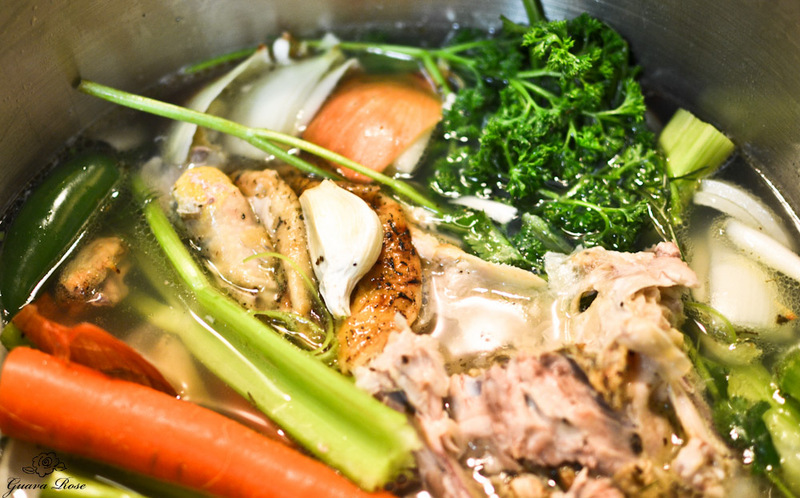 In a large stockpot, place chicken skin and bones. Trim the root end of the onion off and discard. Quarter the onion, and cut or break the celery and carrots in half. Add them to the pot along with the parsley, jalapeno pepper, garlic cloves, and bay leaf. Add water until everything is just covered. Stir in the vinegar. Turn heat on high and bring to a boil. Turn heat down to low and simmer for 3 or more hours. Strain the broth. Skim any fat off the surface. Season to taste with sea salt and/or bouillon. Bring the broth to a low boil. Add the vegetables, turn heat to low and let simmer until the vegetables are just tender. Add the pasta and continue simmering until the pasta is done. Add pieces of cooked chicken if desired and allow to heat through before serving .